Occupying a bright, uncluttered spot on the north side of Old Market Street, a relatively small street front belies the sizable interior. There’s limited seating upstairs with a communal table and two small bars, while downstairs, in a basement half open to the front window, is more seating in the shape of a couple of tables and a very comfortable-looking sofa. The local Extract Coffee Roasters provide the house-espresso and a seasonal filter blend (available through the Clever Dripper) while regular guests make appearances on both espresso and filter. There’s also a wide range of (Extract) beans to buy. While it doesn’t have No 12’s extensive food menu, there are also decent breakfast, lunch and cake options if you’re hungry. 25A Market Street opened in October 2016, an offshoot of the highly successful No 12 Easton by Bristol’s Stapleton Road station. 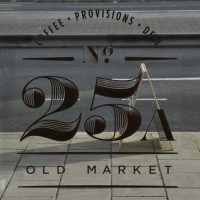 25A represents a move closer to the city centre, but still employing No 12’s café/deli/provisions model with an all-round community vibe. 25A occupies the left-hand unit on the ground floor of a glorious, old building, a tapas bar on the right. The front’s all glass, the recessed door on the left, a single, large window to the right, flooding the interior (and basement, which we’ll come to) with light, particularly given its south-facing aspect. An unusual feature greets you on entering: you walk across a short bridge to the main part of 25A. Personally, I’d favour a drawbridge which 25A can pull up when it’s closed, but I suspect that this might be going a little too far… Down below, rather than a moat, is a lovely basement, accessible via broad steps on the right. This unusual set-up’s main advantage, other than giving me something to write about, is in providing the basement with plenty of natural light, a light well on steroids if you will. Back upstairs, it’s an open, bright, uncluttered space with wonderfully high ceilings. The counter is in the corner at the back on the left, sitting directly ahead of you as you enter, with a tempting array of cakes to greet you. There’s a small (three-person) bar against the wall to the left here if you want to chat with either Brian, the manager, or, if he’s not there, the equally lovely Chris, who is the owner. Alternatively, to the right, there’s a long, thin, 12-person communal table running from front to back and, beyond that, against the back wall, another three-person bar. The deli/provisions side of No 12 is catered to by the rows of shelves on the right-hand wall, plus the various produce in the chiller cabinets in the right-hand portion of the counter. The basement, which goes halfway back, is a similarly open, bright, uncluttered space, again with wonderfully high ceilings, the sense of space being helped by having the front open to the windows above. There’s a six-person table at the bottom of the stairs, a five-person table on the left against the back wall and, best of all, a three-seater sofa and matching armchair tucked away to the right under the stairs. When it comes to coffee, 25A stays faithful to Extract Coffee Roasters which supplies the house espresso (a Peruvian coffee) and a seasonal filter (currently a Colombian). These are joined by a guest espresso, which was Square Mile’s Red Brick during my visit, but since it changes every two weeks or so, expect something different when you visit. Joining Extract on the filter are a couple of guests which change every three weeks or so. When I was there, 25A was keeping it local with options from Extract (again) and Little & Long. Having always liked Peruvian coffee, I was very happy to start with my day with a flat white using the house espresso. This was rich and smooth, with lots of chocolate notes, going perfectly with the creamy milk from the local Bruton Dairy. I also had a couple of slices of crunchy sour dough toast for breakfast, smothered with homemade mixed berry jam. Heaven. This entry was posted in Basements, Breakfast, Bristol, Cafes, Cake, Laptop Friendly, Lunch, Produce/Food Sales, Retailers and tagged include by Brian Williams. Bookmark the permalink.